…..I was on the phone when he wandered into the yard. I saw him cross the street and head towards the cranberry bushes by the goats. The goats in unison watched him pluck the berries. I saw P, our horse, turn her head in more than mild curiosity. I thought to myself, “Oh, look at the lone Canada Goose” and continued my conversation. It took me a few moments to register how highly unusual it is to see a lone Canada Goose on foot during hunting season. …..I cut the conversation short when I saw him walk up the middle of our road. As I prayed that he would be kept safe from hunters and cars, he turned eastward and walked up towards our coyote den and the hunter-filled woods and fields beyond. He disappeared from sight. P started to graze again. …..The next day, P was consumed with terror and concern about something in the east towards the coyote den. I could not see what worried her so and assumed it was the coyotes. Running into her stall, she slipped. For hours, she would not eat. I brought her in early, but she continued to watch eastward through her stall window. Finally, towards dusk, she settled down. …..The next morning she was again worried. She snorted and blew as if to shoo something out of her pasture. It seemed unlikely anything would be inside the fence as we had fortified the wooden fence against coyotes. I went to the second floor of our home and gazed, through binoculars, into the field. At the far end, inside the fence, was the goose. …..My reassurances to P were of no avail. I decided to walk up to see if the goose could fly. P watched me with great concern. As I got to the far end of the field, the goose seemed to disappear. Suddenly I almost stumbled upon him. He had pulled himself into a tiny ball. The goose rose to his full height, spread his wings and took a few steps away from me. .He turned to look at me and seemed to beckon to me to walk with him. I did. Side by side, we walked down the hill towards P’s paddock, the goose carrying on a conversation the entire way. …..With great concern, P watched us approach. Suddenly, the goose stopped and looked at me. I knew he wanted to go further but was cautious of going into P’s paddock. I assured him I also was wary of entering her paddock when she was frightened. He turned and walked back up the hill. I continued on out the gate. I thought if I could entice P into her stall, the goose might make his way to freedom. 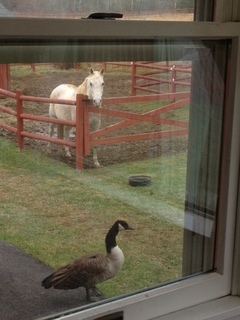 …..Again, once inside her stall, P watched the goose through her window. I went back into the house and soon after, I looked out my kitchen window. The goose was in her paddock. …..When I went out the next morning, I found the goose asleep in her paddock near her stall. He rose and disappeared into the grass in the larger field. Once out of her stall, P was wary but not panicked. All that morning I watched as the goose would approach P. When she showed signs of fear, he would retreat. With great patience and persistence, he gained her trust. Towards late afternoon, I saw him come around the corner of her barn and stand in her little paddock, ten feet from her. He bowed his head, his beak touching the ground. P lowered her head, nose touching the ground. Again, the goose bowed. P bowed. They repeated this several times. Then, the goose turned his head to the left. P did the same. The goose repeated the gesture as did P. After several minutes of this, the two of them relaxed and stood in quiet comradeship. I left P out a little later that afternoon. When I brought her in, the goose again explored her paddock and then settled down in some deep grass near her stall. P moved her hay under her window so she could watch the goose. …..Again, the next morning, the goose was resting in a pile of hay near her stall. P was quiet, calm, and content. I asked her what the goose’s name was and imagined she answered “Jeff”. I imagined the goose preferred “Geoffrey” and so he was named. …..Geoffrey moved a short distance into the larger field to graze when I opened the door for P. She moved her hay out of her stall so she could watch him. The two were never far apart that morning. …..In the early afternoon, I heard P blowing and snorting. I looked out of my kitchen window to see P in a frenzy. Geoffrey had wandered eastward into the large pasture, towards the fields and woods beyond where there were now many hunters. I knew immediately P’s concern for his safety. …..I walked up the field to where Geoffrey had wandered, P watching. He looked at me with curiosity and I told him he was unsafe and needed to come back to the barn. Incredibly, he walked back with me and went to stand a short distance from P. I returned to the house. The two of them stood side by side for some time listening to the gunshots in the fields above. …..When Geoffrey started to wander into the field again, I saw P gently herd him under the fence into the yard next to the house. He looked around and settled in a corner on the grass. The shots increased. P went in to her stall later than usual that afternoon, keeping an eye on her new friend. …..Again that night, Geoffrey slept by her stall. …..The next morning, he went north into her smaller pasture while she ate her breakfast. I walked the dogs at the usual time. As I was standing in front of the house, I could hear a chevron of geese approaching from the south. It was unusual to hear geese flying in the early morning during hunting season. I looked up, and could see 5 or 6 small chevrons flying towards me. They travelled over my head, north to the pasture where Geoffrey stood. Chevron by chevron, they flew over the lone, earthbound goose. They called to him. I could hear him respond. The geese then changed direction and flew south. Geoffrey was quiet. I so hoped he would follow his flock. …..He seemed so very little after that. …..For the rest of the day, he and P were inseparable. In the late afternoon, Geoffrey, on his own, came into the yard while the gunshots flew in the fields above. …..I became very conscious of how I carried myself. When I went out of the door, I gently closed it behind me. I was ever so conscious of what I was thinking and feeling. Like Geoffrey, I stepped slowly and gently upon the earth. I bowed whenever I met him and lowered my gaze. He responded likewise and did not flee. …..That night it rained. When I went out to the barn to feed P her evening meal, Geoffrey was lying down, head outstretched, in the spot where P usually stands during the day. I paused, not sure if he was all right. Gently I called to him. He did not move. I held my breath and watched. Finally he rose wearily and went to the tall grass near the barn. …..The morning after he had bade farewell to his flock, I saw him lying in the smaller field, north of the house. He had chosen a spot I could see from my kitchen window. I watched with concern as I did my dishes. A raven flew over the house, down past my window and towards Geoffrey, claws outstretched. At the last minute, the raven flew upwards and away. Geoffrey laid there for a long time. …..He came back to P’s paddock and stood with her, both gazing eastward. It was Saturday, and the woods were filled with hunters. I placed some cracked corn out for him which he readily accepted. I left to do some errands. When I returned, I slowly drove into the driveway and saw Geoffrey standing at the gate waiting for me. …..That evening, he stayed close to the house, near his food, water, and a little shelter we had bought for him. I marveled at how the dogs had accepted him in their yard, never barking or approaching him, never glancing his way. I felt a peace that he was staying closer to the house. My husband and I spoke of ways to help him through the long winter. …..We brought him into the barn and wrapped him in warm towels, placing him on a bed of hay. We moved a little heater near him. It was of no use. P and the goats ate their hay somberly. …..Seven days with Geoffrey. A lifetime in seven days.